On June 21, Kawasaki Heavy Industries announced plans to send its BULLDOG landmine clearing system to Cambodia, where it will be put to the test in the field. The BULLDOG system, which employs Kawasaki's robotic remote control and electronic control technology, has undergone some upgrades after conducting mine clearing operations in Afghanistan in 2004 and 2005. By conducting test operations in Cambodian minefields, Kawasaki hopes to gather data that will help them develop a BULLDOG system well-suited to the local vegetation, soil conditions, and terrain. As was the case in Afghanistan, the operations are financed by a grant extended by the Japanese government. 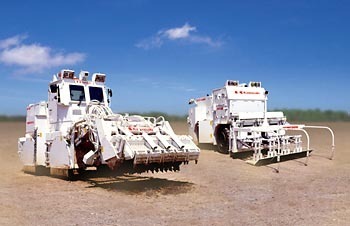 The BULLDOG system consists of three parts: (1) the MINE DOG, a mine-detecting vehicle equipped with mine detection sensors and a variety of cameras, (2) the MINE BULL, a mine-clearing vehicle equipped with a drum that drills the earth to excavate and detonate mines and a mechanism to collect waste products, and (3) a system of devices for remote control and operation. Relying on an 8-channel system of mine detection sensors that automatically adjust their height with respect to uneven terrain, the MINE DOG can detect anti-personnel mines and unexploded bombs underground. A camera mounted on top of the vehicle detects trip wires and mines scattered on the ground surface. Sensor data is analyzed using software developed by Kawasaki, which allows operators to distinguish mines from objects such as rocks or cavities in the soil. For the tests in Cambodia, Kawasaki added features to help the MINE DOG deal with vegetation, as well as features to improve mobility on soft ground. The MINE BULL detonates anti-personnel mines by means of a high-speed digging drum that turns the soil in front of the vehicle. The vehicle's excavation depth monitor, GPS antenna, and route-monitoring cameras ensure steady digging and forward motion, and a system of magnets extract waste materials that typically slow down the safety inspections that follow mine clearing operations. To deal with Cambodia's sticky soil, Kawasaki added a system of brushes to prevent soil buildup and mobility-enhancing features similar to those added to the MINE DOG. The MINE BULL will be shipped to Cambodia in June, and work will begin in a minefield near Siem Reap in July. The MINE DOG will be shipped in August, and it will go to work beginning in October. Kawasaki aims to use the data obtained from these tests to quickly develop a BULLDOG system well-suited for the Cambodian landscape, which they hope will make a valuable contribution to international demining activities that involve the Japanese government and international NGOs. hi. does anyone have any bulldog training videos?